Mobikwik is giving Flat 10% Instant CashBack on all Recharge for Mobile,DTH & Data Card. Follow below steps. Then go to " My Account" , scroll down and enter the promo code "10PERMOBI"
Once you receive your cash back, you can recharge your mobile, data card or DTH. Note: You have to make a payment and you will get 10% additional money in your mobikwik account which you can use to recharge your mobile anytime. Tata Nano is back with its Expert Quiz, last time this quiz got opened in the month of December and many participants have got Tata Nano Shaped pen drive, For those who missed, Tata Nano on Facebook again started the same contest , so hurry now and win exciting prizes.Once you have given correct answers to all the questions, you would be eligible for Tata Nano gifts and merchandises. How to win Assured Gift? Click here to go to contest source page and LIKE the page. Click on Start Quiz button. After completing 10 Questions, Submit your Score. The scheme shall be valid for entries submitted before 30th April, 2012. Question 1: What is the Engine Capacity of Nano? Question 2: How Powerful is the engine of Nano? Question 3: Tata Nano Have SUV-Like ground Clearance of ____? Question 4: How much torque does new nano generate at the RPM of 4000 +/-500 ? 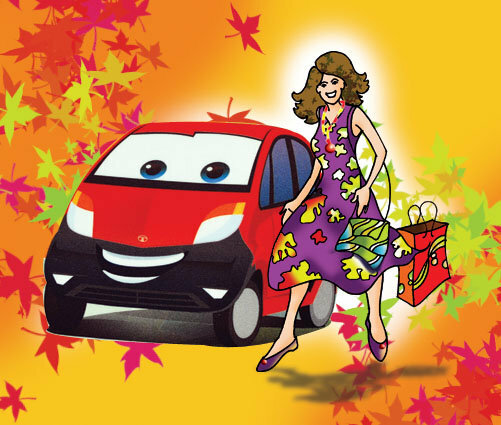 Question 5: The nano has a shortest turning radius of ___? Question 6: Nano has ____ % of more space than standard small cars. Question 7: Nano 2012 has full wheel caps in which variant? Question 8 Nano is india's most fuel efficient car with an ARAI certified mileage of ___ in BS4 Test. Question 9: The down payment of Tata nano starts from? Question 10: In how many colors is the nano 2012 available? So guys, Grab your pendrives and comment below if you have any query! Shopclues.com is back with another jaw dropping deal. 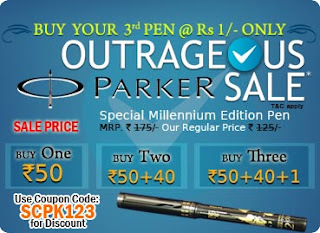 This time they are giving 3 Pcs Parker Special Millennium Edition Pen @ just Rs 91. Orignial cost of each pen is Rs 175. You are getting 3 Parker pens worth Rs 175*3= Rs 525 for just Rs 91. Pay Rs 91 & Check out. Note: You have to pay Rs 15 as shipping extra. A new deal from Sankalpdeals eBay is here. 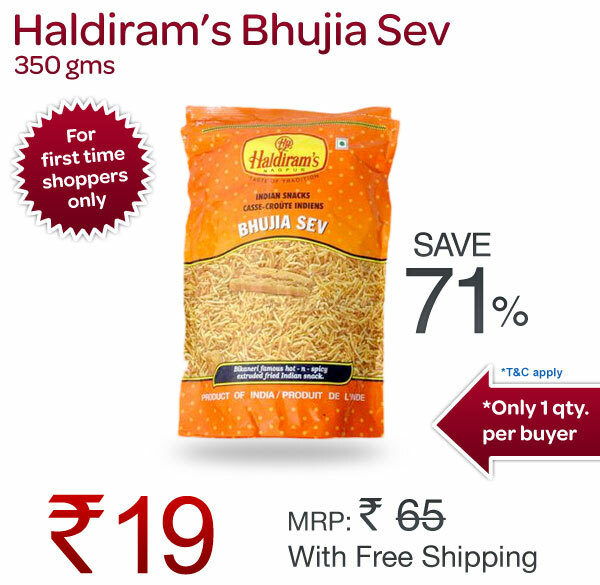 Get Haldiram’s Bhujia Sev - (350 gms) @ Rs 19/- only. Original worth of this Pack is Rs 65. You dont have pay anything for Shipping. Its free. How to get Haldiram’s Bhujia Sev 350 gms at Rs 19/- with free shipping? Cbazaar is one of the largest online Indian Ethnic clothing retailer. This is the first time they are selling Brander & good Quality Kurti at just Rs 190. Usually they sell High Priced products. Get this benefit and avail this offer. How to Buy Branded Designer Kurti at just Rs.190 with free shipping? Click here to visit product page at cbazaar. Pay Rs 225 -34 = Rs 191 only. After Rs 150 off on 799 coupon, Snapdeal is back with another great offer on deals. 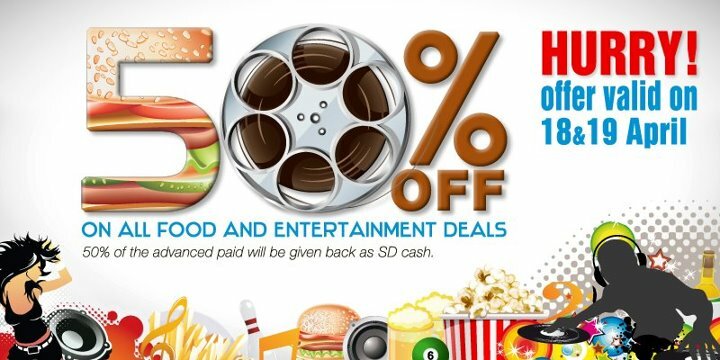 Get 50% off on All Food & Entertainment deals at snapdeal for 2 days. This deal is valid only for 18th and 19th April. So buy it fast. 50% off is in form of SD cash back which you can use it anytime in future on snapdeal. How to buy 50% off on all Food & Entertainment deals? You will get 50% paid amount as cashback in your Snapdeal account. After Mobikwik 10% instant Cashback offer we have another great offer for our readers. Yebhi is giving Rs.10 discount on all mobile recharge of Rs.50 or more. So you can avail this offer if you want to recharge for low amount. Else you can use Mobikwik 10% off method. 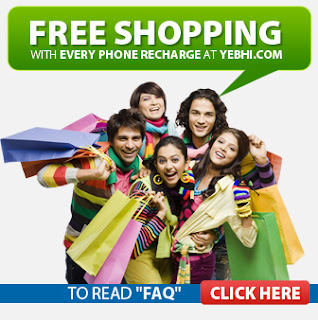 How to Get Rs.10 off on recharge of Rs.50 or more from Yebhi.com? Enter your Details like Mobile Number, Operator, Circle etc. Avail this offer before the coupon code expires.